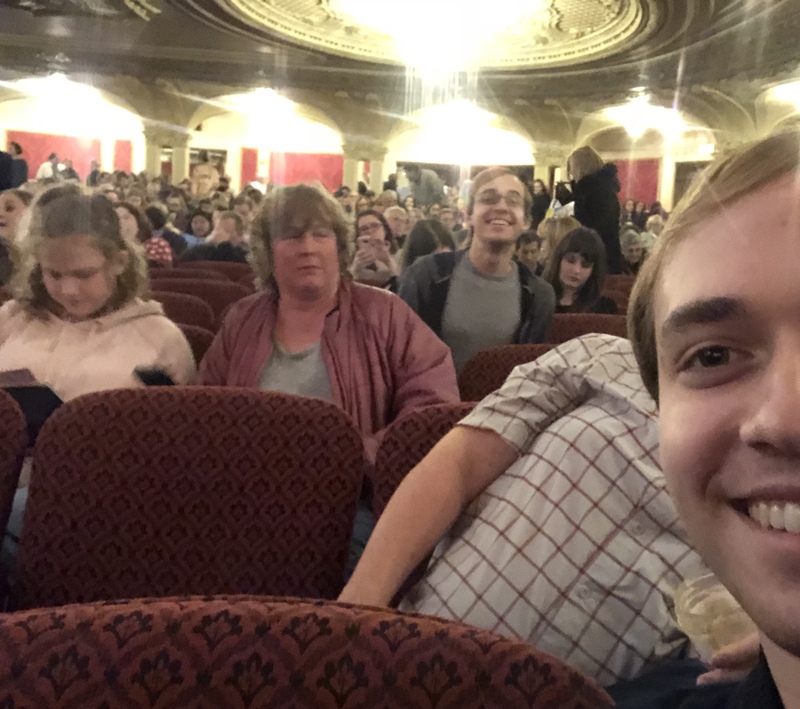 This is the first half of this post and it was written March 5th, 2018 about our second time seeing waitress on March 3rd, 2018. If you haven’t read the part that was posted before this, scroll down to the line! Well we held our end of the promise, and did in fact see waitress again this past Saturday!!! We invited our friend Charlotte M. ‘20 after having an angsty conversation at around 2 am in our angsty messenger chat that has an angsty title that shall not be named. Then, at the end of a meeting of a club we’re all part of, we invited Caroline B. ‘21, Charlotte’s fellow J entry friend!!! We walked over to Macgregor. After some initial confusion about where to meet Charlotte and Caroline because, 1.5 years at MIT, and we still don’t know the structure/exits/entrances of MacG. (We did learn from Charlotte that the reason why MacG calls their living communities “entries,” is because they all have different entrances! *mindblown*). 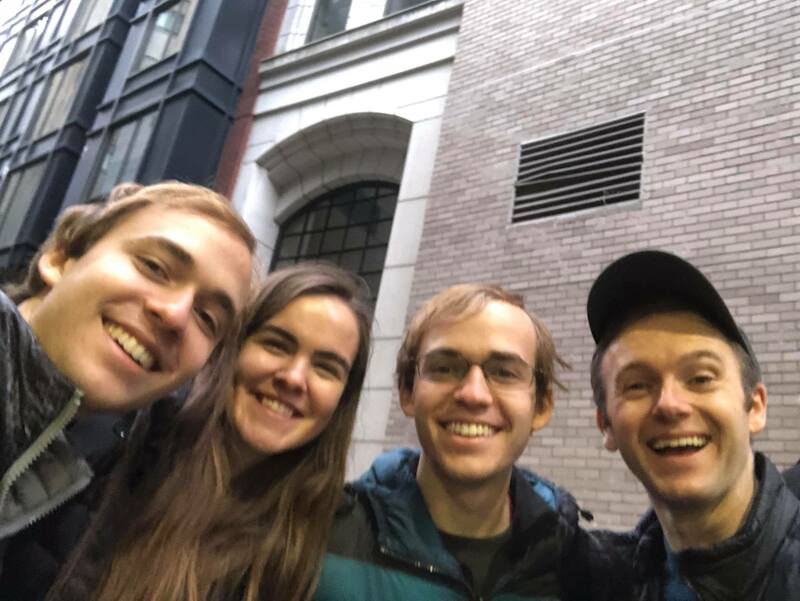 Eventually we all found each other, and began walking over to the T stop at Kendall. On the way, we talked about Waitress and other musicals and stuff! We get to the Boston Opera House at around 12:15ish, almost 2 hours before the show was starting! 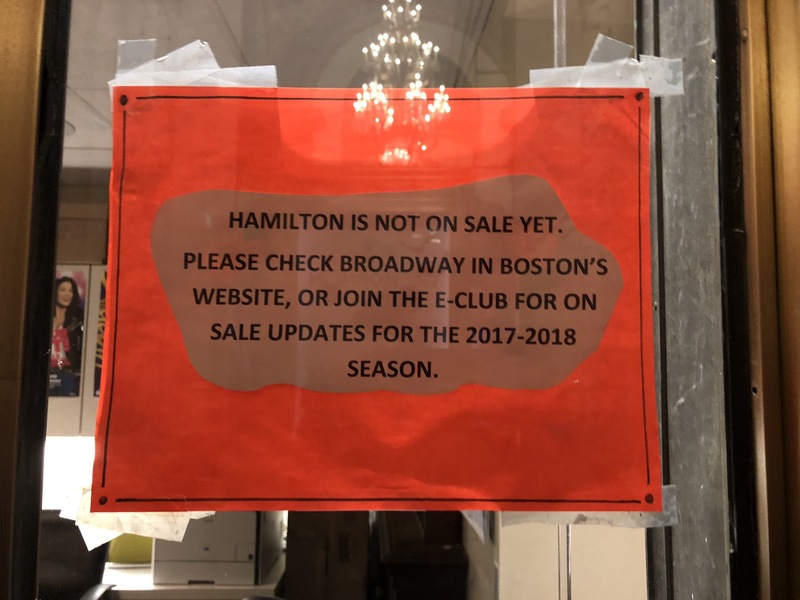 That’s exactly how much earlier we came to the Boston Opera House last week, and there was literally no line! But this time the line was out the door already! While this kind of discouraged us, we were determined to get student rush tickets! At this point, Danny mentioned a conversation he had with Alaisha A. ‘18, who actually went to the same high school as we did and who Charlotte knows through the MIT and Slavery course they both took. Alaisha said, in some context that Danny couldn’t remember, that when you want something really badly (like to get into a school or to get that job offer or, in our case, to get student rush tickets), to mentally “just claim it!” So that’s what we did! 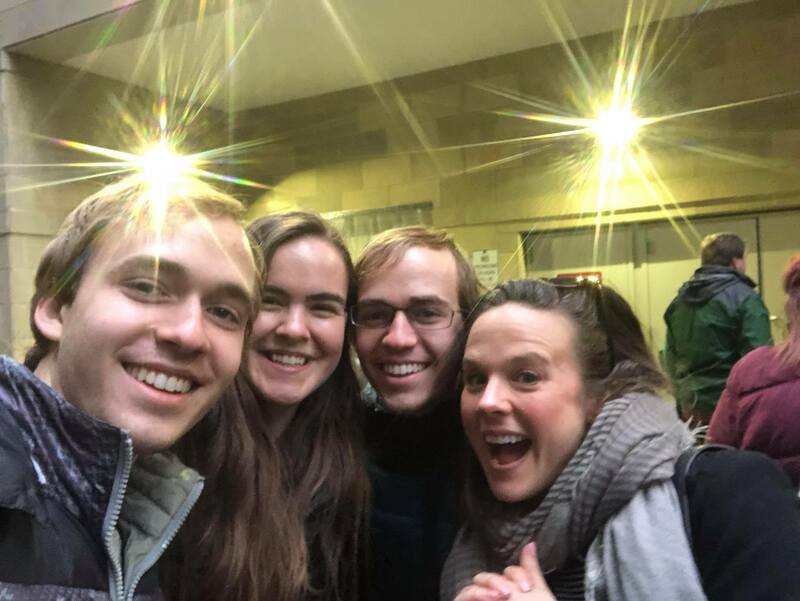 The four of us mentally claimed our tickets for Waitress! Unfortunately, this plan began to seem futile. A person who looked like he had some authority told everyone in line that there was no point to wait for Student Rush tickets past this point, gesturing towards an area about 5 people in front of us. This totally bummed us out! We were actually very VERY close to leaving the line at one point, because the same person came back 2 more times to repeat what he said the first time. But we decided to stay! By the time we got very close to the ticket booth, we accepted that we were not getting tickets, and decided to just ask the ticket booth person how much were regular priced tickets, just to seem like we weren’t waiting in line for nothing. But to our utter surprise, she said that there were still Student Rush tickets left!!!!! When she said that the seats would be in an obstructed view area, we all looked at each other and we’re just like “No prob bob! We will take them!! !” (Okay, that’s not exactly how it happened, but basically.) Mentally claiming our tickets worked! Thanks Alaisha! Then!!! Something super fun happened!! Right after we got tickets, we heard a voice saying “Danny! !” We all turned around, and saw blogger-herself-in-the-flesh Afeefah K. ‘21!!! She was literally a couple people behind us, but we didn’t even notice until that moment! 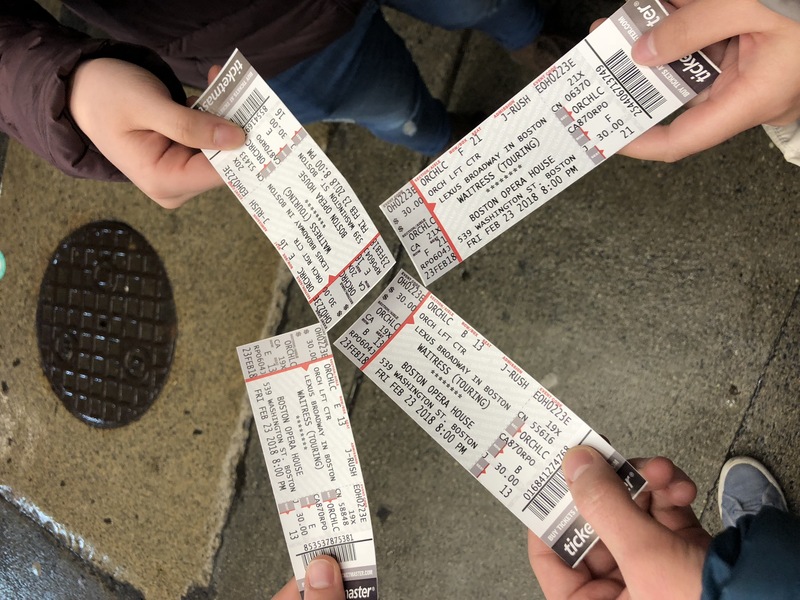 After some jumbled and excited conversation about blogging about this experience and taking a picture to document this super coincidental moment, we decided to wait for her and her two friends to get tickets. 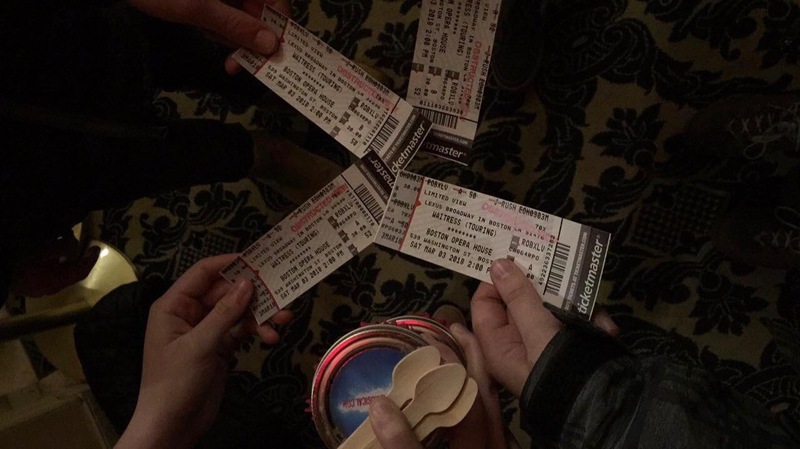 So the four of us stayed to the side, all very nervous and anxious to see if they’d be able to get tickets. After 3 minutes that felt like 15, we saw Afeefah and her friends walking from the ticket booth smiling, tickets in hand!! YESSSS!!!! We then met her friends, Rukia H. ‘21 and Yara K. ‘21! And then, we realized that we actually kind of knew Rukia before! 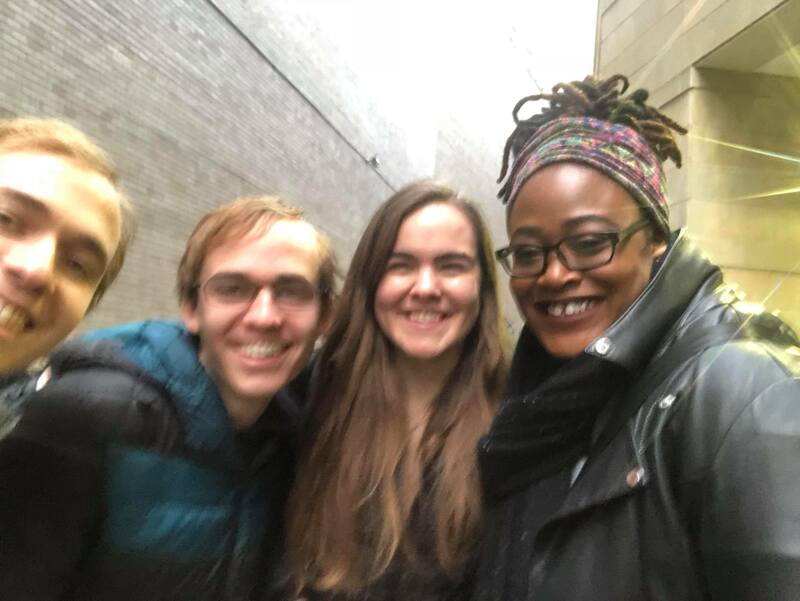 We were catching up with our friend Habiba N. ‘20, which was really fun since we hadn’t spoken since before winter break! As we were wrapping up, someone stopped Habiba and whispered something to her. We kind of just walked in front, and when Habiba caught up to us, she said that her friend just asked her if we were the Waitress Twins! Apparently, she read our initial Waitress blog last week, and really wanted to see the show! That made us very happy! So, if you haven’t figured yet, Rukia was the friend that whispered to Habiba that day! 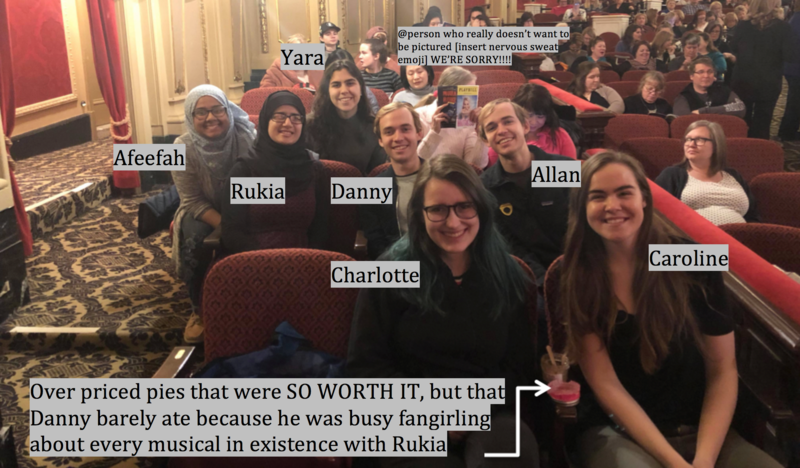 We were really happy to see that our blog made Rukia want to go see Waitress!!! And we were even happier that she, Afeefah, and Yara happened to go for the same show we did!!! Then, another really cool thing happened! When we got to our seats, we realized that literally all of us were sitting in the same area!!!! We were not expecting this at all, because the first time we went, all of us were sitting separately. Then another cool thing happened!! (So many cool things haha) If you look at the above picture, there is an empty seat next to Charlotte. Well, that’s because the person who was sitting there, Jonathan, was taking our picture (Thanks Jonathan! (if you’re reading this)). Anyways, we met Jonathan when he joined the conversation we were having before the show started, and he was really nice! He’s a highschool sophmore who’s into musicals as much as we are! He asked us if we were planning to go stage dooring (the process of waiting outside the theater to get a chance to meet/get autographs from/take pictures with the cast members!) after the show. We were like, “Whhaattt you can do that here?!?! ?” because we were under the impression for some reason that stagedooring is only a thing you can do after seeing shows on Broadway ™ in NYC ™. 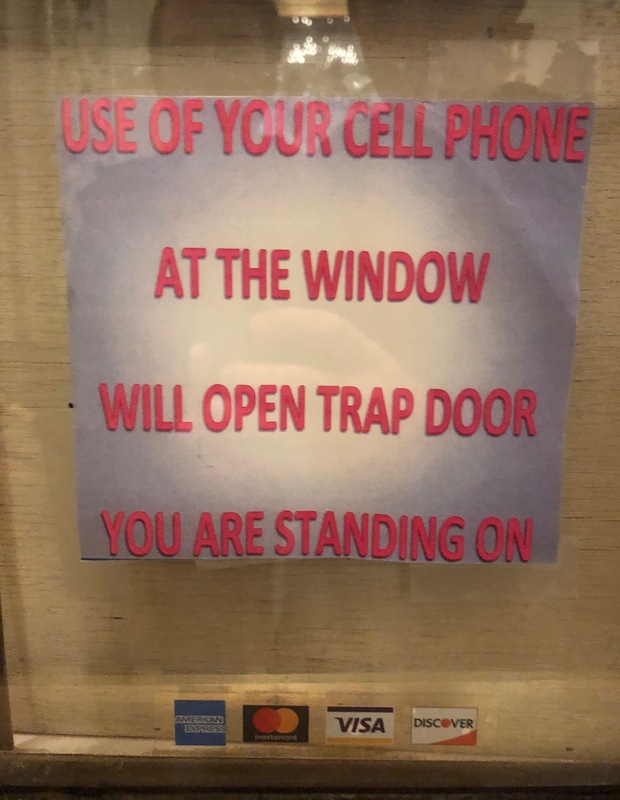 But apparently not! So then Jonathan offered to take us to the stage door after the show, because it was in a hiddenish location. He also commented on this post below! Thanks Jonathan!! Then the show happened! OMG honestly it was JUST AS INCREDIBLE as the first time! 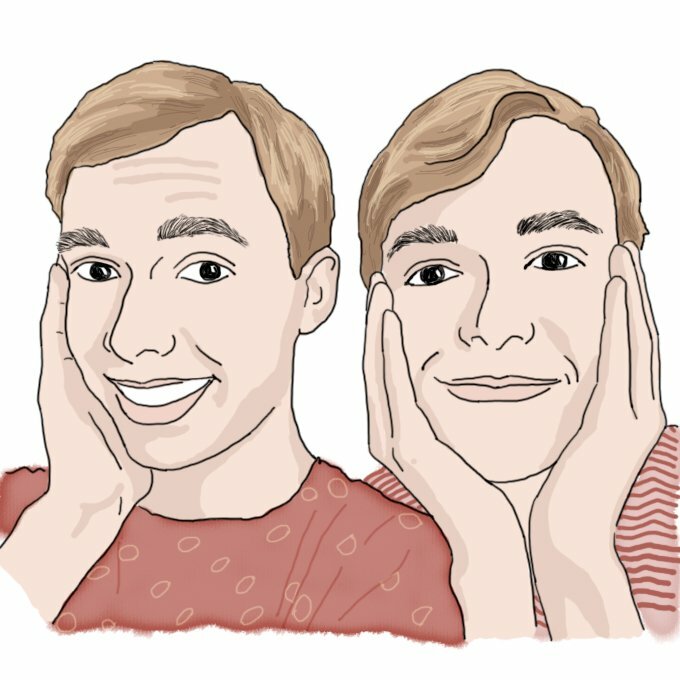 If you want to read about our favorite parts, go to the second half of this post! As the people who read our blogger application (we think it was Petey, Elizabeth, Selam, Yuliya, Allan, and Erick (?)) know, we are OBSESSED WITH MUSICALS!!!! One in particular, Waitress by Sara Bareilles, has been our go-to feel-good musical for the past 1.5-2ish years. 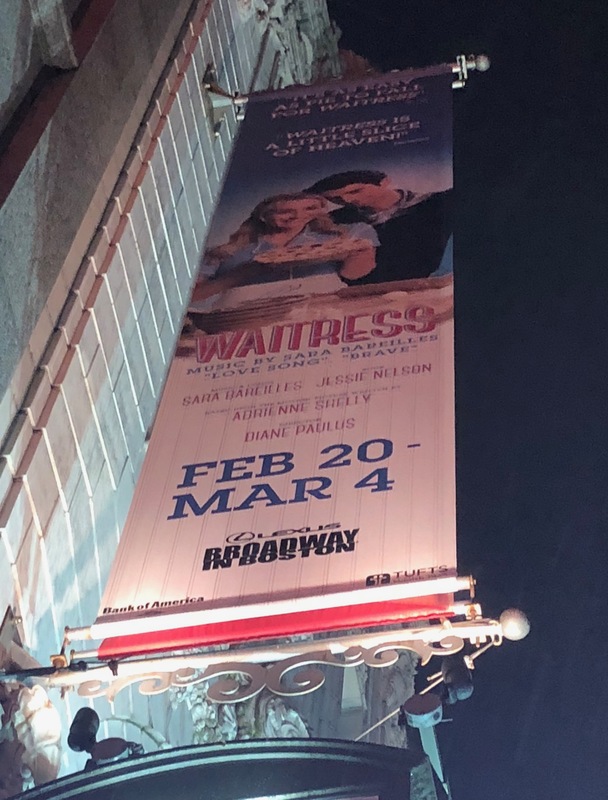 This musical, based on the 2007 film of the same name, centers around a waitress named Jenna who makes biblically good pies at Joe’s Dinner in the rural South. Jenna is stuck in an abusive relationship with her awful husband Earl, she is stuck in a cycle of “carbon copy” days of tips and coffee, and she is literally stuck in the middle of nowhere with no way to leave and only pies and baking to bring her peace and clarity. But when she finds out she is pregnant with Earl’s child, baking, for the first time in her life, can’t mask her problems. The show then follows Jenna as she navigates her circumstances, and she might just fall in love with her gynecologist along the way. This short summary, however, does not nearly encapsulate how FREAKING BEAUTIFUL this show is. Please listen to the soundtrack to understand. 2) SO A COUPLE WEEKS AGO, WE STUMBLED ON THIS VIDEO. It’s a college freshman, Mateo Lewis, majoring in musical theater analyzing the song What Baking Can Do! Highly recommend watching his analysis. IT HIGHKEY BLEW OUR MINDS!! Anyways, one of the things he said was about how Betsy Wolfe (the third Broadway Jenna) did something that neither the first nor second (Jessie Mueller and Sara Bareilles, respectively) did. In one of the riffs, Betsy Wolfe goes up to a C, which according to Mateo, is incredibly difficult to do vocally. And the actress who we saw playing Jenna, Desi Oakley, did that same Betsy Wolfe riff!!!!! When we heard it we were like YEESSS WE SEE YOU DESI! WE KNOW THAT THAT WAS JUST SUPER HARD TO PULL OFF, BUT YOU NAILED IT!!!!! SLAYYYYYY!!!!! 5) On the note of Dawn, her boyfriend (and later, husband), is actually the FUNNIEST CHARACTER OF ALL TIME. LIKE FROM WHAT HE SAID TO HIS GESTURES. SO GOOD. He, like Dawn, loves the American Revolution and plays Paul Revere. Their relationship is absolutely adorable and hysterical at the same time.  6) Becky, one of the other waitresses in the pie shop, with the SHEAR POWER OF HER VOICE willed the speakers and microphone to become louder. LIKE WE ARE NOT JOKING WHEN WE SAY WE COULD LITERALLY FEEL THE VIBRATIONS!! 7) Becky and Jenna were making jokes about having an affair with each other and then Becky says “Nah this ain’t no affair. This here is for life.” SO GOOD! SO WHOLESOME! THEIR FRIENDSHIP WAS SO BEAUTIFUL! 8) THE NURSE!!! THIS CHARACTER IS JUST ONE EXAMPLE OF WHY SEEING A SHOW LIVE IS SO WORTH IT! Shows like Waitress that aren’t made entirely of songs (like Hamilton or The Great Comet are), have so much GOOD dialogue. We didn’t even know about this character, but she was hilarious. Here is a snippet:. Jenna, her doctor, and the nurse are in the office. The doctor asks Jenna if she has been taking her prenatal vitamins. Jenna replies, “Faithfully.” And the nurse, who knows what’s going on between the doctor and Jenna, replies in the sassiest voice, “Faithfully my a**” as she walks out of the room. This nurse character had a bunch more sassy and perfectly timed comedic moments, but that’s just one of them! 9) THE SET DESIGN WAS SO MAGNIFICENT!!! THEY HAD THIS ONE IMAGE IN THE BACKGROUND OF PHONE LINES! AND THEY USED IT SO WELL IN SO MANY SCENES, BUT SPECIFICALLY IT WAS USED AMAZINGLY IN “SHE USED TO BE MINE”!!! This is the song that Jenna sings at her lowest point. She had been saving up money and hiding it from Earl so she could enter her pie in a contest and win enough money to “buy [herself and her] baby a knew life,” but Earl managed to find the money. She begins singing this song in her living room. But as she continues singing, the walls of her living room get removed off stage, exposing the giant image of the rural countryside and phone lines. GOOSEBUMPS. The combination of Jenna’s emotional build and the set expanding left her seeming smaller, but sounding larger. It was absolutely heart wrenching and breathtaking at the same time. Here is the tony performance, which was done essentially how the show did it (minus the intro with Sara Bareilles on the piano). 10) PIE MONTAGES. This is something else you don’t get from the soundtrack!! Something integral to Jenna’s character is that she bakes pies to escape her world and cope with her problems. Every time something not ideal happens, she begins to invent a new pie. Purple lights turn on and fill the stage with a sense of curiosity and wonder. The spotlight trails Jenna. And we are now transported to Jenna’s mind per say. She narrates the ingredients, which are very unconventional, like chocolate and passion fruit or poppy seeds and ginger snaps. And two or three ensemble actors pour those ingredients into a bowl, as she poetically describes what they all mean to her and what they represent in that situation. A more concrete example would be really helpful to illustrate this better, but we can’t remember the exact lines from the show, and if we tried, we just wouldn’t do it justice. But hopefully that description made enough sense. 11) One of the first pies she invents in the show is “I don’t want Earl’s baby pie,” and the last one she invents, with her daughter Lulu this time, is “Lulu’s Strawberry Dream Pie.” These two pies are a really cool representation of Jenna’s progression as a character. First, she didn’t want a baby because she thought that it would only make her situation worse. But when she finally gave birth, it was her baby that gave her the strength to stand up to Earl, to tell him that she wants a divorce and to never see him again, right in that delivery room. And she not only named a pie after her daughter, but also her new pie shop – Lulu’s Pie’s. 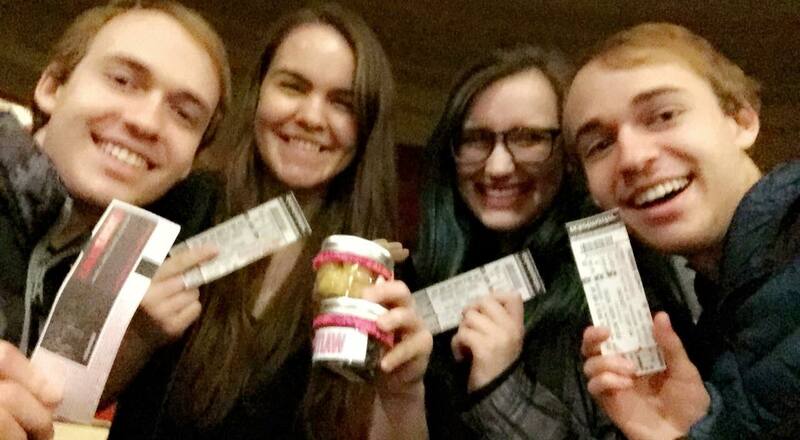 All four of us were sitting in different places in the theater, because the tickets were student rush (aka leftovers). One row in front of Allan was this girl who looked like she was in middle or high school and her mom. Periodically throughout the show, the girl was affectionately resting her head on her mom’s shoulder, because the show was very much about mother-daughter relationships (with Jenna getting pregnant and initially not wanting the baby, but by the end of the show learning that she loves the baby more than anyone else.) So it was just very touching to see this show affecting this girl in the audience. After the show ended, there was a karaoke segment, which was very exciting because we have seen youtube clips of this and knew it was a thing that happened after certain shows! AND NOW WE WERE LUCKY ENOUGH TO COME TO A SHOW WHERE THEY DID IT!!! We then see Nora, in a very relatable way (because we all have had those moments being embarrassed by our parents) walking reluctantly to the stage. The song she chose was “She Used to Be Mine”, which is THE song in Waitress. Before she started singing, one of the ensemble members stepped in and decided to start singing with Nora to make her less nervous. But the second Nora opened her mouth, you could tell she was an AMAZING singer!!! She was still nervous in the first half, so the ensemble member was helping her along, but towards the middle of the song she stepped to the side and let Nora shine!!! And Nora absolutely KILLED it!!! Like every high note! Every Belt! It was so CRAZY!!!!! And what’s even crazier is that out of all the people who were doing karaoke, she was the only one who was unprepared!! When she first came on stage and was choosing a song, she said “I’m being such a bad musical theater kid. 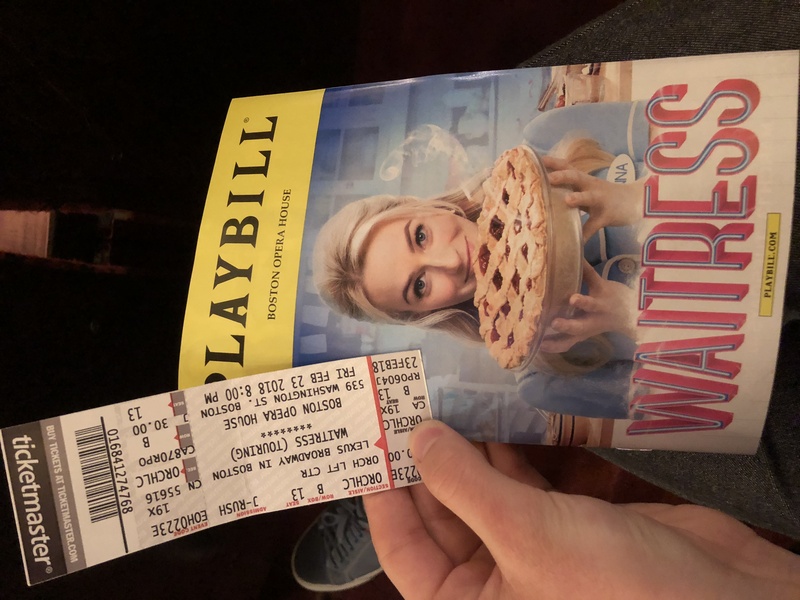 This was my first time seeing Waitress and I’ve never even listened to the soundtrack before this, so I don’t know any of the lyrics.” EVERYONE IN THE AUDIENCE WAS SO ABSOLUTLEY IMPRESSED AND BLOWN AWAY BY NOT ONLY HER TALENT, BUT ALSO HER FEARLESSNESS!!! LITERALLY THIS WAS THE BEST WAY TO END THE NIGHT!! !